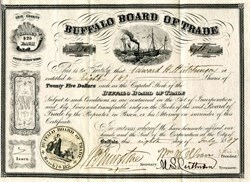 Beautiful uncancalled stock certificate from the Buffalo Board of Trade issued in 1887. This historic document has an ornate border around it with a vignettes of ships in a harbor and the Board of Trade Seal. This item has the signatures of the Buffalo Board of Trade’s V. President, Treasurer and Secretary. Issued to Edward H. Hutchinson. 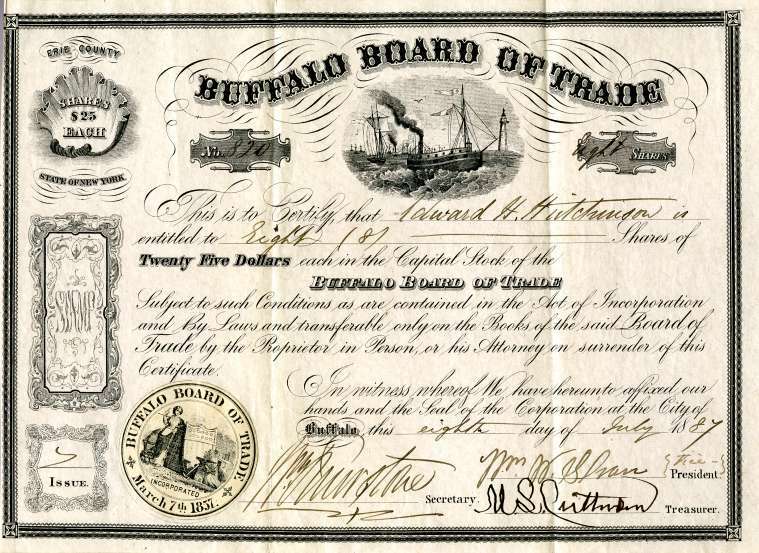 The Buffalo Board of Trade was a member organization consisting of business men of commercial and manufacturing interests from the Buffalo area. Buffalo was the first city on the Great Lakes to organize such a body.